Like strawberries and cream, lace and tulle is one of those winning combinations that never grows old. A beautiful floaty tulle skirt decorated with intricate lace appliqués or paired with a stunning lace bodice is just a match made in heaven! It’s a look our Anna Soprano collection does extremely well. 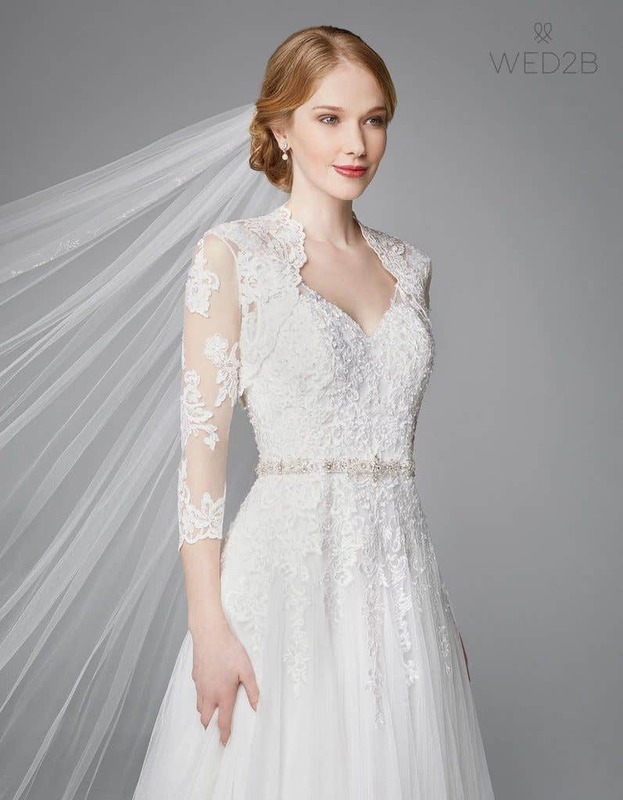 The designs are all about elegant refinement and timeless grace, created for the romantic bride who wants her natural beauty to be the star of the show. 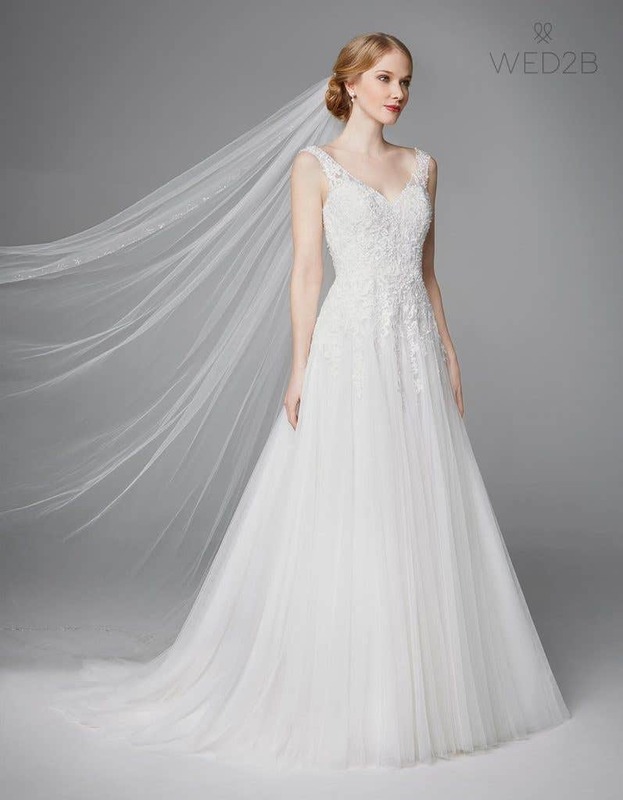 So, if you’re looking for a lace and tulle wedding dress, read on. 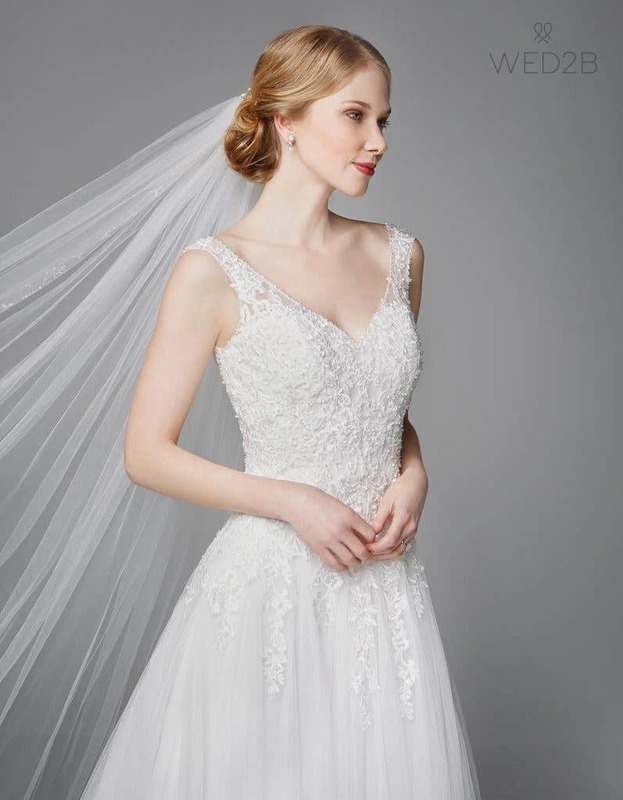 We’ve picked three breathtaking designs from the collection that feature gorgeous high quality lace alongside layers of light-as-air tulle… it’s the perfect marriage! 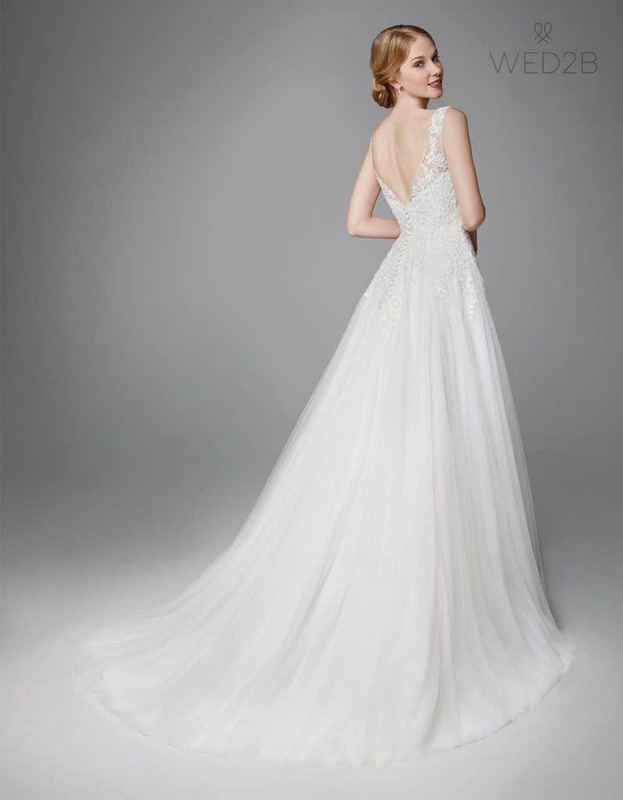 Alice is exactly the kind of romantic lace and tulle wedding dress that the Anna Sorrano range is famous for. This slim A-line silhouette is pretty, feminine and quietly stunning. 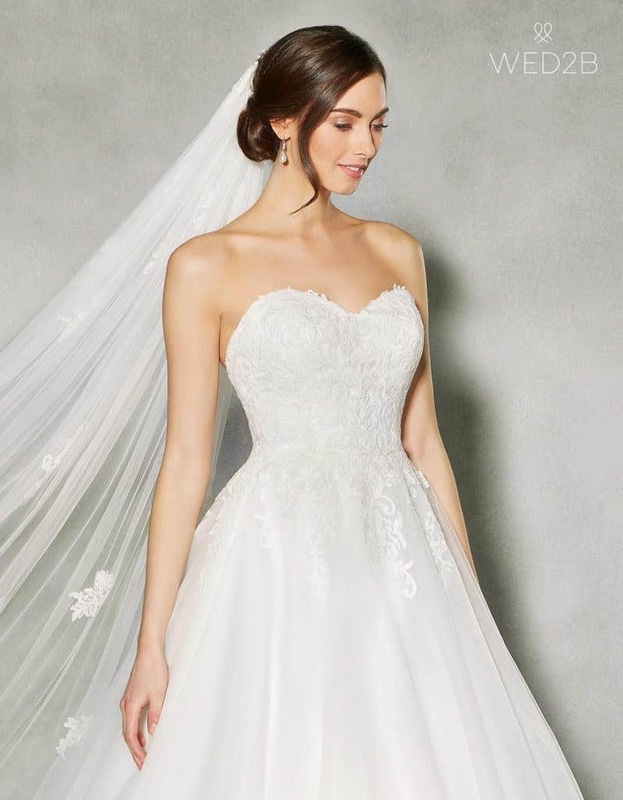 Look closely and you’ll see the beautiful floral lace appliqués that cover the entire bodice before tumbling elegantly down the soft tulle skirt. Their careful placement is also perfectly designed to enhance the waistline. The embroidered lace is also exquisitely detailed. You can see here how the beading is simple and subtle, and has been used to give a gentle shimmer without overpowering the look. At the back the graceful V-neck and stylish row of covered buttons give a softy romantic finish. The low back also offers the perfect amount of coverage. 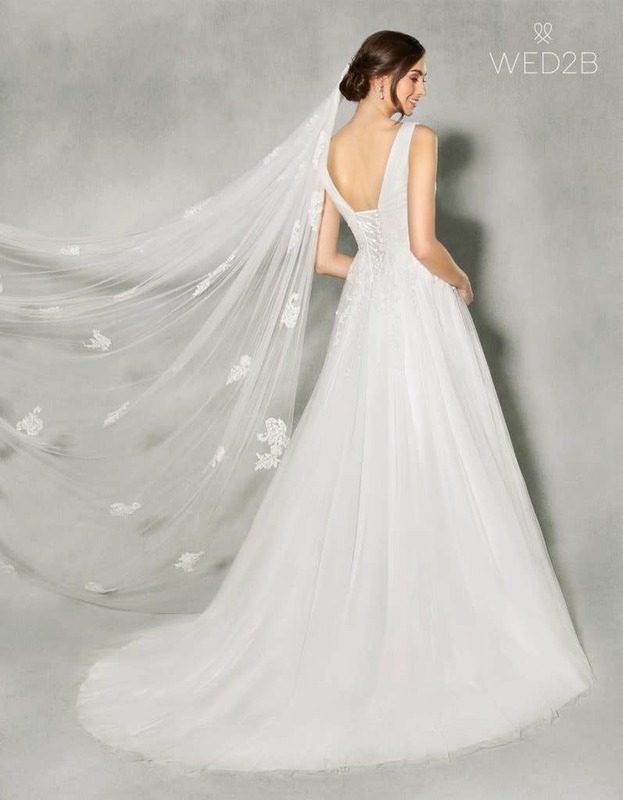 Then there’s the flowing tulle skirt and ethereal, floaty train, which are elegance itself. Wear this design with our 189 underskirt for just a little extra volume. This design looks fabulous with a little bit of sparkle at the waist, such as our Estella belt. 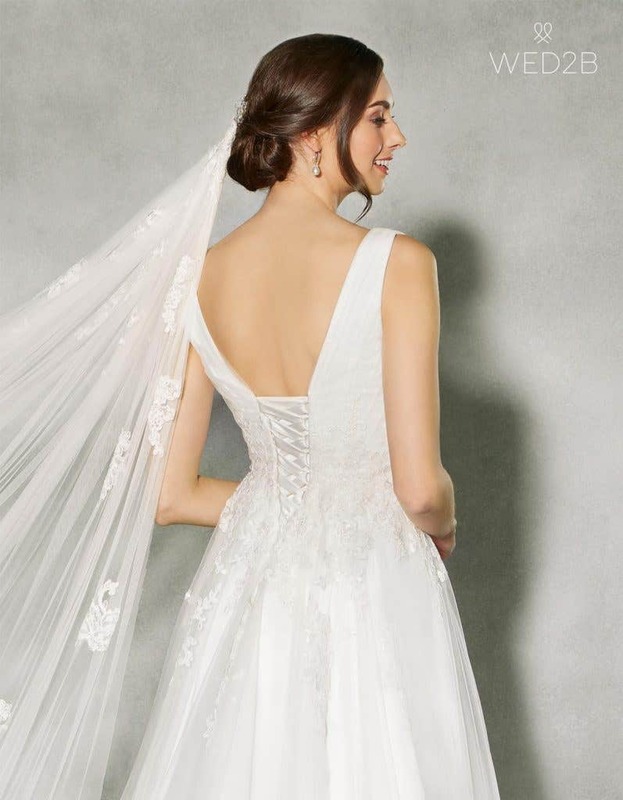 The simple chic of our Rococo veil also works perfectly with the understated elegance of the dress. If you’d like a little more coverage our Halle bolero is the ideal accompaniment. Why not wear it for the ceremony and then remove for the evening to create a brand new look? For a similar sleeveless lace and tulle wedding dress you could also take a look at Effie. Or, if you’d prefer a classically romantic look with sleeves, with think you’ll love Millicent too. This is how Anna Sorrano does a princess gown. 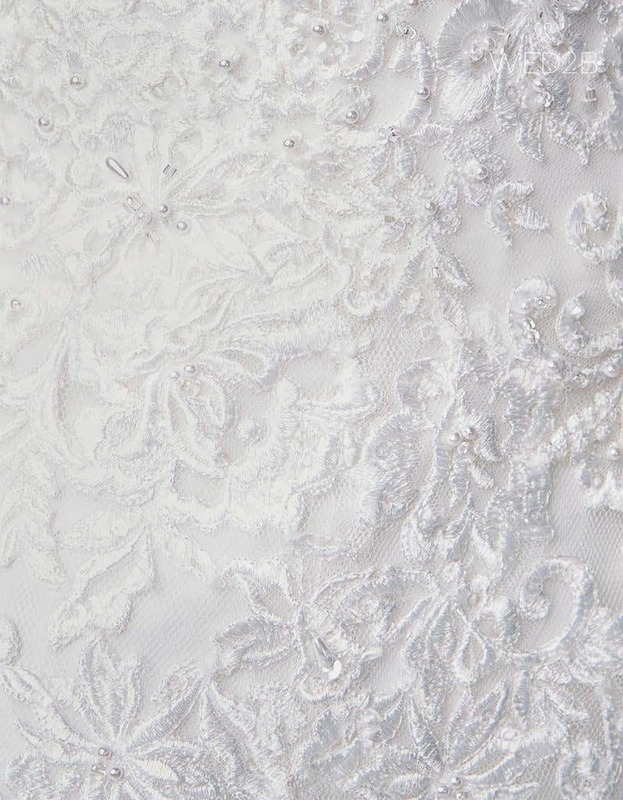 Bethanie is a truly timeless classic, with style, sophistication and a demure fairy tale feel without too much glitz! 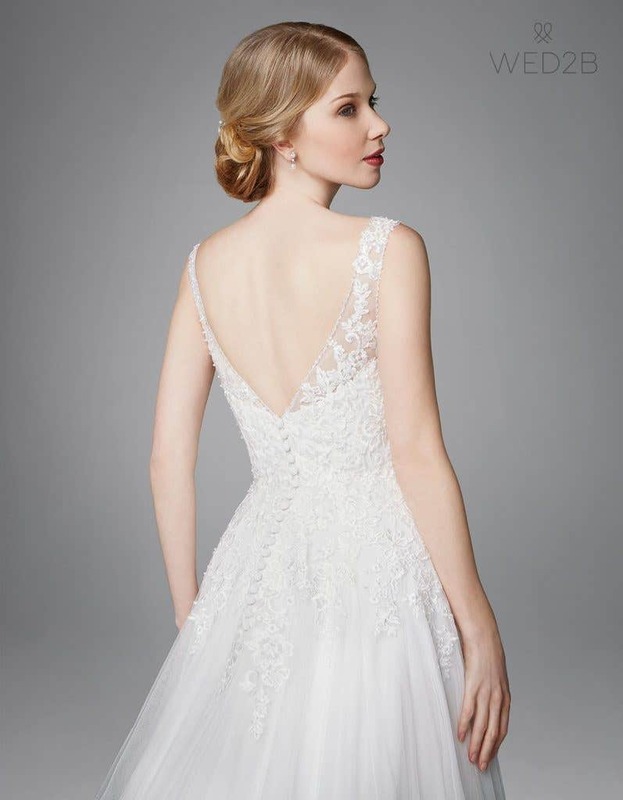 The feminine sweetheart neckline and the beautiful bodice covered with lace appliqués are just to die for. Look closely and you’ll also see the subtle clear sequins, which catch the light as you move. The lace-up back looks beautiful and is designed to give comfortable support. 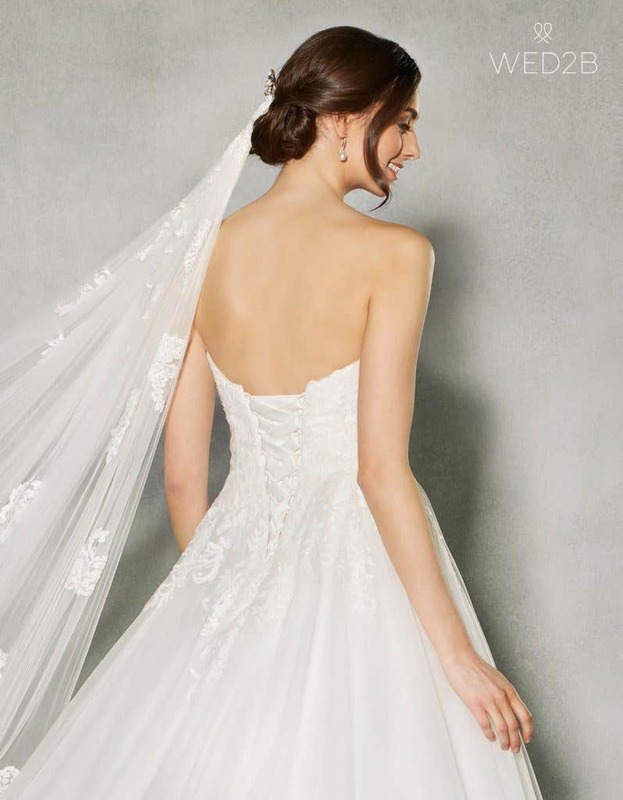 It also pulls the dress in at the waist for the ideal fit, meaning you’re unlikely to need any alterations. 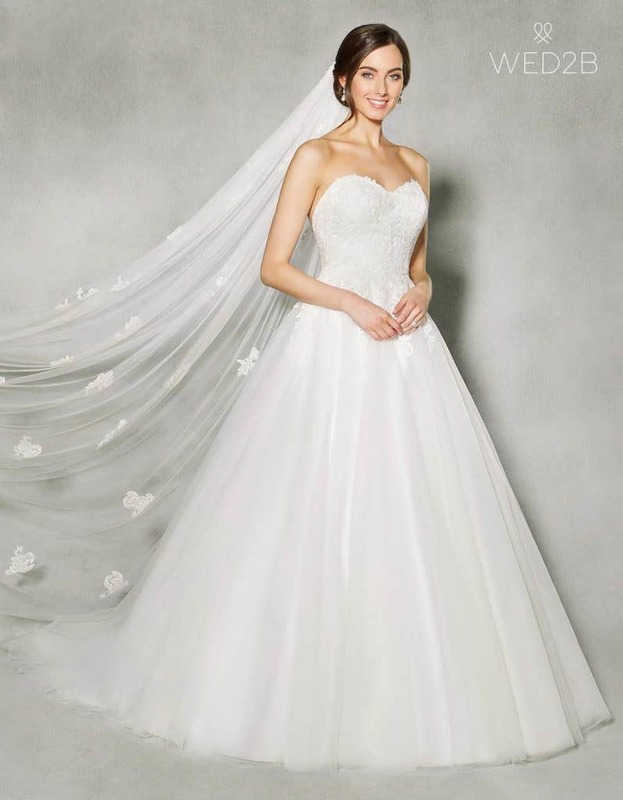 Wear this design with our sumptuous 163 underskirt for the perfect princess swish as you walk. 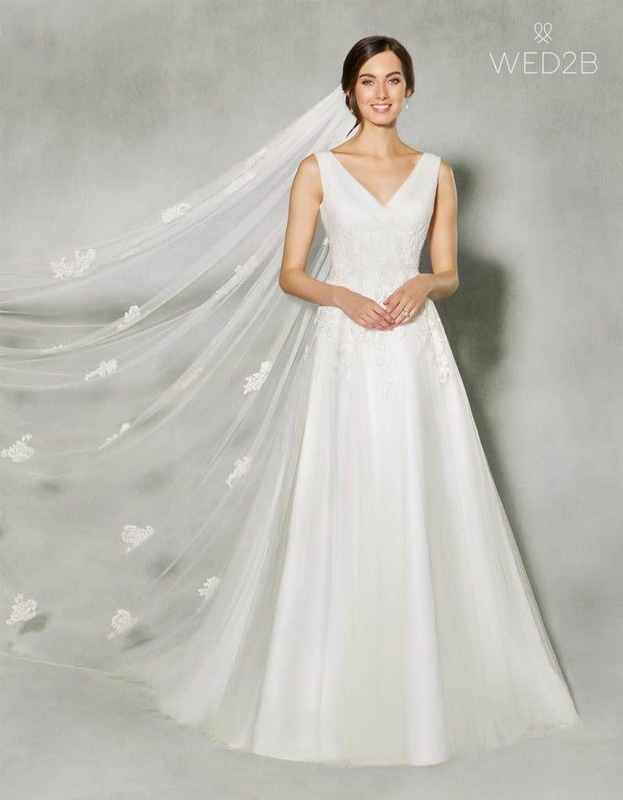 It also looks unforgettable with our shimmering Tiffany belt, our understated Langley veil and our elegant Deco comb. For a similar look and feel take a look at Penny, Maddie and Annalisa too. Francine really is stunning. 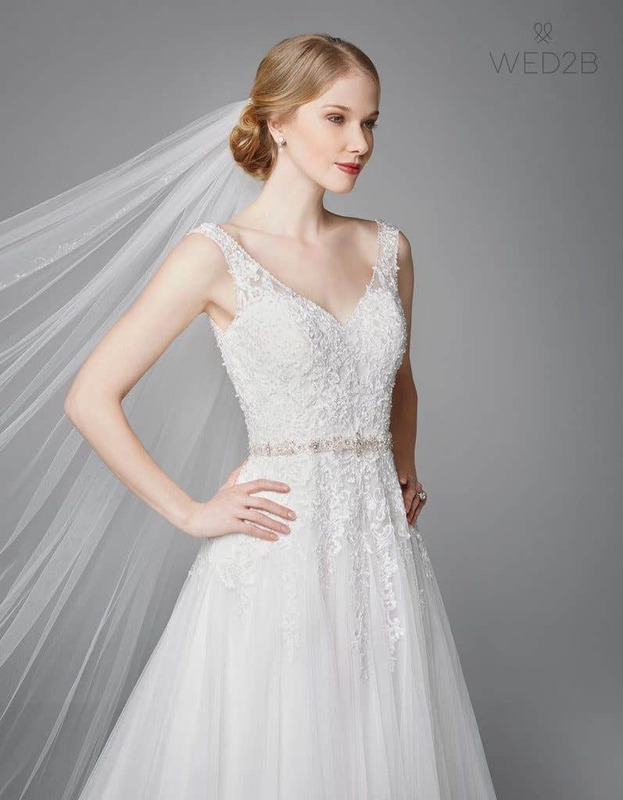 The light-as-air tulle covered with floral lace appliqués combined with the flattering ruched bodice and the gently sparkling sequins really is breathtaking. The slim A-line skirt creates a light and floaty effect, so there’s no need for an underskirt. The elegant V-neckline also shows off attractive collarbones while providing plenty of coverage. The floral appliqués around the waist help to highlight this key area and give a pretty feminine feel. And we love the lace-up detail, which helps to give the perfect fit. 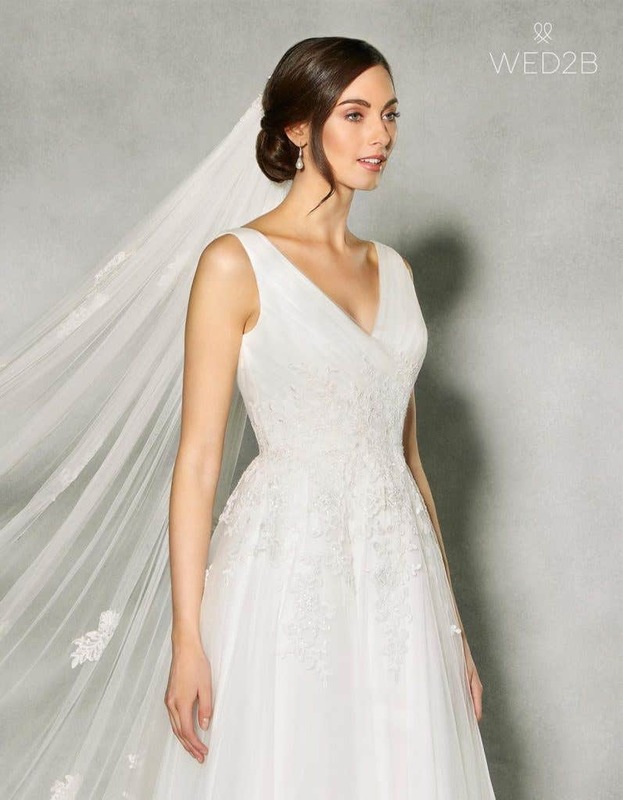 Wear this dress with our London veil with its scattered lace appliqués. To add even more definition to your waist. 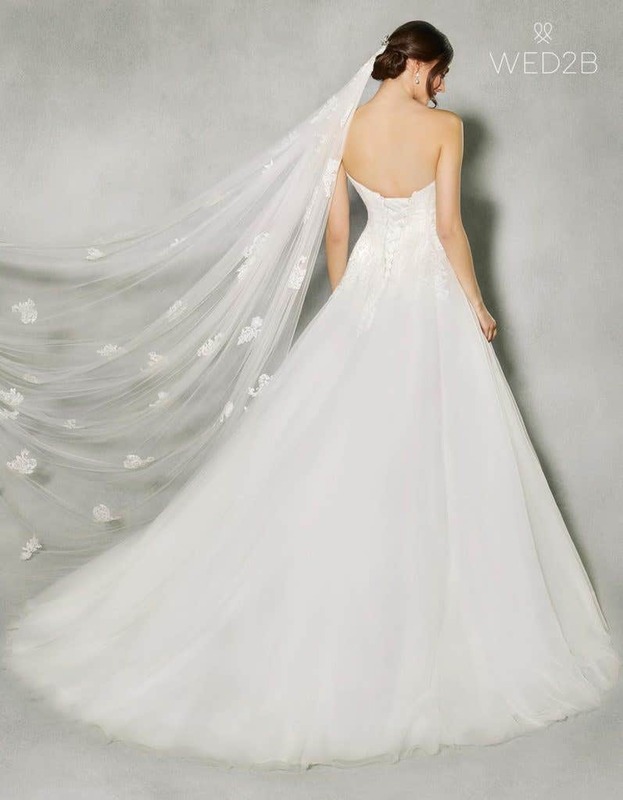 And if you want a lace and tulle wedding dress similar to this one, take a look at Adriana, Carina and Whitney too.